Property 8: Holidays in Lagrasse. 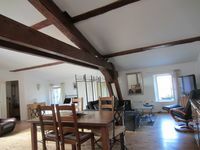 Stunning Studio, private terrace near Carcassone. Property 9: Independant gite on wine domaine Sleeps 2 or 4, Saltwater heated pool spa. Property 10: Gîte with fabulous terrace, between Carcassonne and the sea, sleeps 6. Property 12: Lodgings of character in an old wine cellar, swimming pool, park, terraces ..
We loved our time in the apartment in Lagrasse. The town is a gem - a highlight of our trip. Kids swam in the river, we walked around town and visited the abbey and other nearby sites. Good restaurants nearby. Apartment is well located, big enough for the 4 of us (2 adult, 2 kids), well maintained and clean, and has most things you would need for a short stay. Looking forward to returning.